What would a formal Fitch proof for this look like? 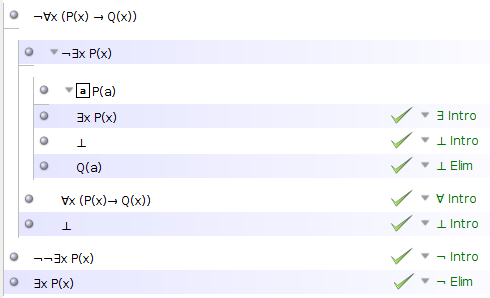 I am given ¬∀x(P(x)→Q(x)), and need to derive ∃xP(x) from it. 10) ∃xP(x) --- from 2) by Double Negation (or ¬-elim), discharging [a]. The following proof is the same as Mauro ALLEGRANZA's but it uses Klement's Fitch-style proof checker. Descriptions of the rules are in forallx. Both are available online and listed below. They may help as supplementary material to what you are currently using. You may be required in your proof checker to represent contradictions as conjunctions of contradictory statements. 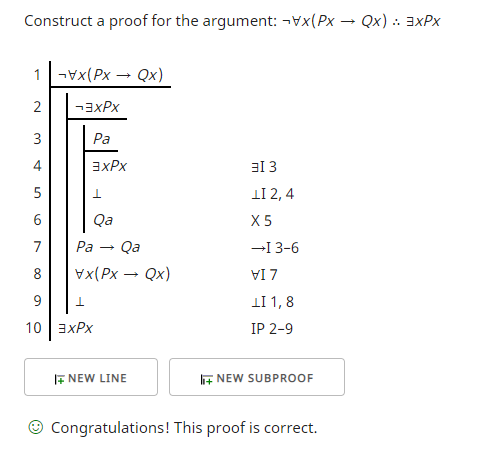 This proof checker only requires noting the contradiction as "⊥" and listing the contradictory lines such as I did on lines 5 and 9. 2.∃x~(P(x)->Q(x)) ~ Universal out Pr. Not the answer you're looking for? Browse other questions tagged logic proof fitch quantification or ask your own question. Prove P v ~P using most basic rules? “Don't do what I tell you not to do” - what to do if you always do the opposite? How can you prove I'm not a dog? Does anyone have a proof checker they prefer using for modal logic? Does rejecting the law of the excluded middle mean rejecting it for all propositions or only for those one cannot derive?